Home World WTH Bird-Brained Idea - Nests for Humans? Bird-Brained Idea - Nests for Humans? This (bird) brain-child of a Californian builder will set you back anywhere between $4,000 and $20,000. 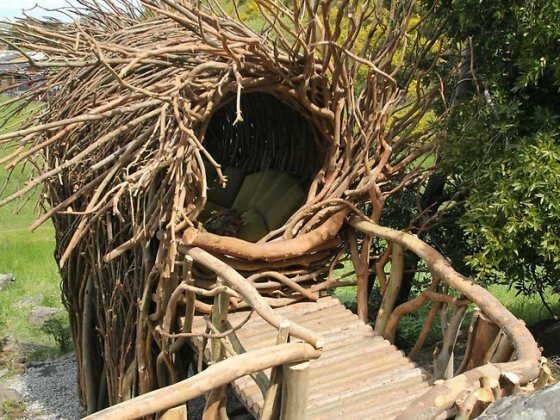 For some people, that might be your entire 'nest egg' - but at least you could get to retire in a custom-made, human-sized nest! For a roof over your head, that's pretty 'cheep' right? Enough of the puns (they weren't that 'egg-citing' anyway). All pictures are provided by Jayson Fann. 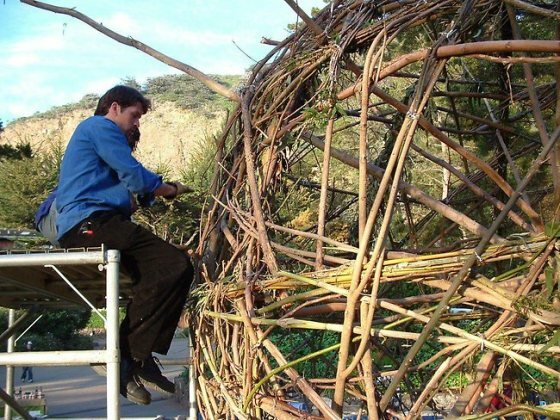 The nests are actually being designed, built and sold by Jayson Fann as 'functional art sculptures'. 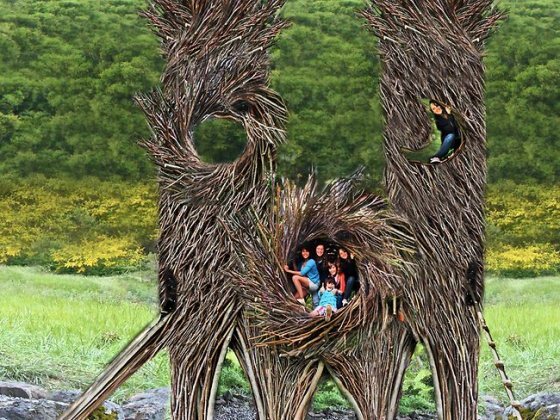 The business Mr Fann runs, creates the people-size nests from locally harvested wood - cut and spiralled together to form the final product. Kids enjoy one of Fanns amazing creations. 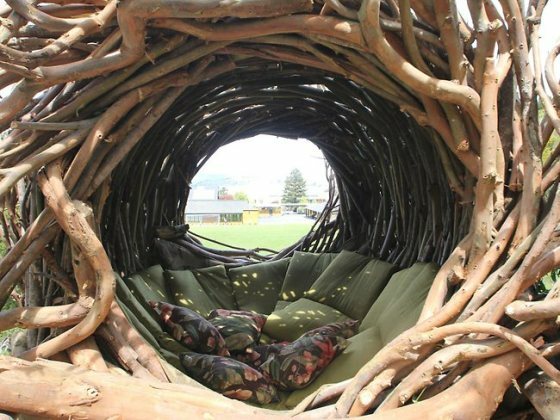 The available nests range from simple indoor love seats to huge thirty-person look-outs. Depending on the size of each project, Mr Fann employs up to two or three assistants. The process begins with stripping branches, all the while ensuring that no damage is done to the living tree. Then leaves and twigs are carefully removed. The intricate puzzle of branches makes for a tough day at the office for Fann. The nests are most commonly from eucalyptus trees, because of their unusual strength. One simple sculpture will require at least two and a half trailers loads of wood. With a few helpers on hand Fann constructs his newest masterpiece. 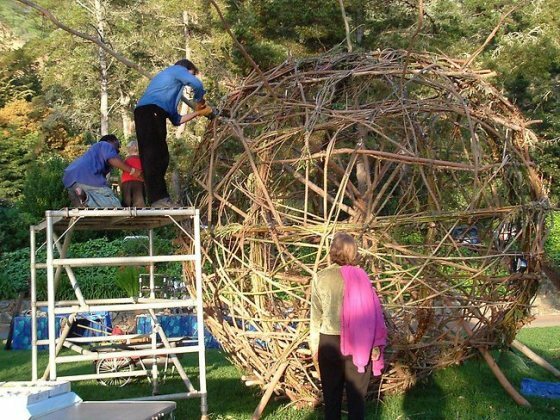 The process begins with wood being 'puzzled' together to create a spiraling pattern. The design provides 'structural integrity' as well as supports the 'flowing aesthetic'. Fann carefully binds the wood together. 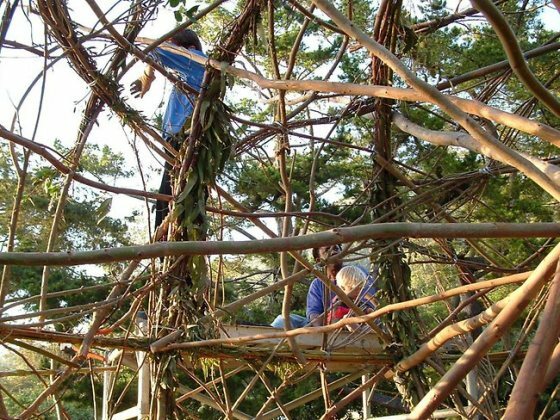 The wood is carefully bent and counter-sunk screws are used to secure the structure, which Mr Fann believes will ensure that the finished nest will remain strong and intact for many years. The nest is lifted onto its base using a crane. 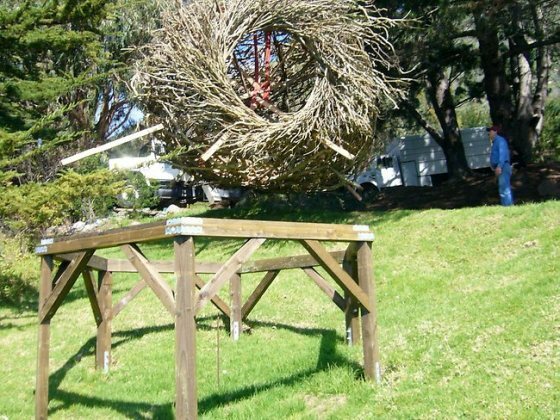 Finally, a strong base is required to place and support the finished nest. According to Mr Fann, moving the nests is not so simple, given that the job requires a crane (another pun?... actually, I don't know if cranes actually live in nests?). A bridge and interior matting is made for the comfort and access to the creation. 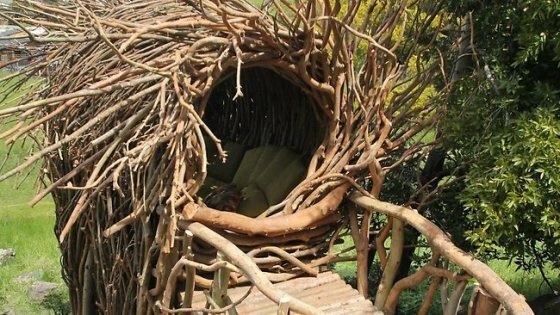 To make the whole thing inhabitable and comfortable, the nest is finished off with an interior mat and a ladder for easy access.